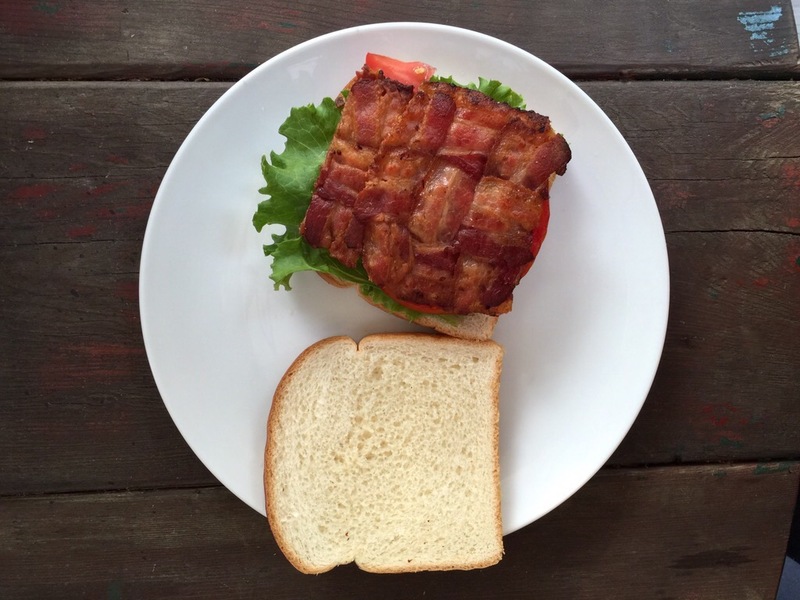 There comes a time every summer that I get an intense craving for a BLT. It usually starts with a stroll along a farmers market, revealing a deliciously plump and ripe beefsteak tomato. The largest of the tomato varieties, a single slice is often big enough to entirely cover a slice of bread, and the garden fresh ones are amazingly juicy and tasty while thick and almost meaty in texture. (On a hot day I like to plate a slice, salt it, and cut into it with a knife and fork like a steak!) Then, further down the table is a beautifully leafy head of lettuce, and I immediately turn my thoughts to a bacon lettuce and tomato sandwich. Secondly, they’re incredibly easy to make, and obviously they don’t require a lot of ingredients. But my simple adjustment to the classic recipe (before you ask, I didn’t invent it – but I’ve adopted it) has become the only way I choose to eat them! The key is to cook your bacon in a waffle weave pattern so each bite promises a taste of that rich meaty flavor! Cut your package of bacon in half so that each slice is now half the length. On a large rimmed cookie sheet, arrange six slices (remember they’re now half the size, so it’s really the equivalent of 3 slices per sandwich) in a waffle weave pattern. Three slices across, three slices down going over and under alternately. (See the photo, it will make sense). One square will cover one sandwich. Repeat with the remaining bacon for additional sandwiches. Cook whatever slices that remain after finishing your waffle patterns in any leftover space on the pan. Depending on the number of slices you’ll probably get only three squares worth per package. To keep the bacon cooking flat, place another sheet pan on top of the bacon covered pan, weighing it down with an oven safe pan or dish. Bake for 20 minutes, checking the bacon regularly (be careful, of the hot bacon grease as you lift the top pan!) and flipping the partially cooked squares over if necessary. When done, carefully remove the top pan and dry the bacon squares on a paper towel. Once cool, the squares will cover the majority of the bread. Place it atop your lettuce and tomato and bread. I like leaving the top of the sandwich exposed so guests appreciate the bacon effort and can add their own condiments. I like mine on untoasted bread with mayo or salad dressing. I won’t lie – I actually prefer the tang of salad dressing – a subject which is hotly debated at the table. I stand by my controversial position. For more of my food love, drink love, and pop culture love, follow @BrianBalthazar on Twitter!